Some of the mums have wandered rather far afield of their points of origin. 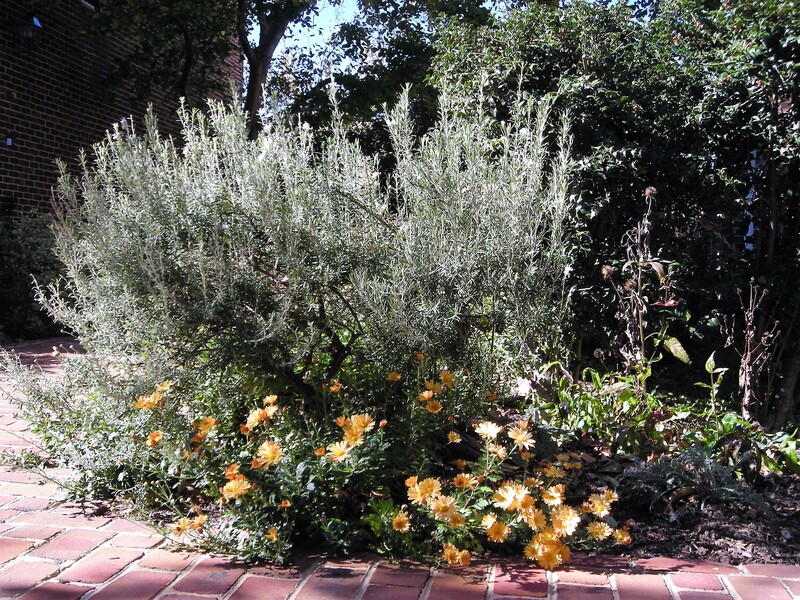 Fall is the time to tally up the results of our gardening year. We plan, we plant, we weed, prune, maintain. Sometimes more, sometimes less. Life happens, and sometimes we don’t attend to all the chores we meant to do. This year, in my home garden, I left a lot of volunteer seedlings of various sorts, curious to see how many would thrive and live. Later, I would thin them. When later came, I decided they would make a splendid show if I let them all bloom. The Dianthus japonicus (Japanese dianthus), for one. And indeed they grew into a thick border of glossy green leaves along the brick paths near my front door. Later in the summer, when some of the nearby perennials were starting to look a bit seedy, the Dianthus were in full bloom, a feathery pink mass that attracted butterflies and looked lovely leaning out over the bricks. Now, they have seeded out and hundreds of tiny seedlings are sprouting at the edge of the bed. The parents will mostly die down completely – I’ve already pulled most of them, but not before shaking more seeds around generously. I think I want a repeat next year. Some of the mums have wandered rather far afield of their points of origin. The hellebores didn’t die back much at all this year and are spreading, and I encourage it. They’ll make me happy when they start to bloom in winter, when there is no such thing as too much bloom in any garden. The evergreen clematis almost went over the wall before I caught it and gave it a pruning. Its glossy leaves were so green, so prolific, I was tempted to let it go on and on. 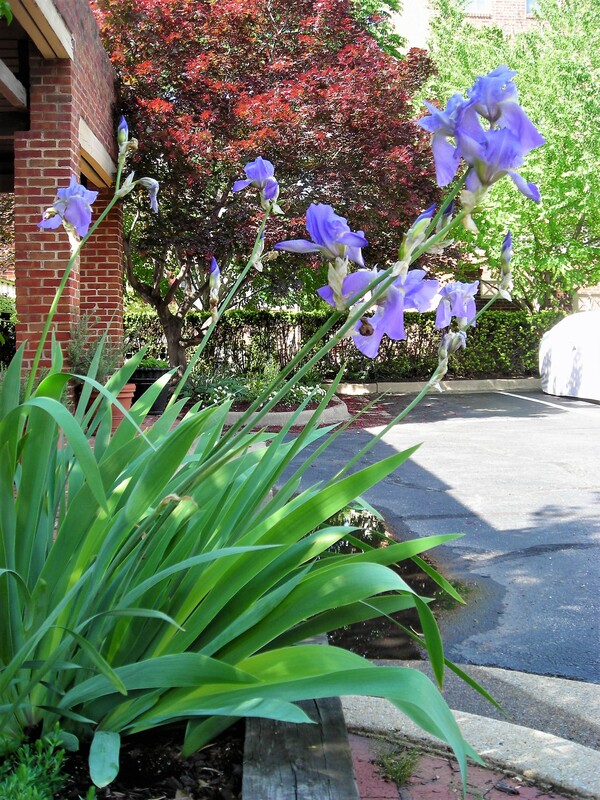 The irises ought to have been divided, but the clumps bloomed generously with big soft purple flowers leaning out toward the sun. Maybe next year. Another garden I know was awash in asters this fall, from palest baby pink to brightest magenta, and from softest lavender to deepest purple – all of it set off by sharp stabs of bright yellow from the masses of interwoven goldenrods or the occasional punch of late blooming red salvias. They were absolutely gorgeous, these seductive blots of color humming with pollinators in a feeding frenzy. Despite the loveliness, we who garden know when we have erred, when we have let the plants take over. It sort of happens by accident: An intended gardening day gets rained out, or we simply don’t have the heart to pull or cut back all the plants we meant to or should have. We run out of time, or will, and the agastache or asters don’t get cut back to half size – or they do and grow madly and profusely anyhow. We let the volunteers grow to see what will happen. We fail to thin the zinnias we seeded around to add late summer annual color. It’s all fine unless that burgeoning life starts smothering out the other plants, blocking their light or crowding their roots or growing space. We will have to deal with this, perhaps more radically than we thought. But later. For now, we stand back and look at the results fondly, mostly, when we are not shaking our heads and wondering how we let this happen. Deep in our hearts we know – we let them live. Because it’s easier, it’s nature at work, it’s Darwinian survival of the fittest. And the bees and bee flies and butterflies are so happy. The garden and the gardener have a lot in common. Both have times of growth and change. Even when the surface looks calm, things may be churning and evolving in the realm below, where turmoil of the soil – or of the soul – is going on. Sometimes we thrive, sometimes we stagnate, resting or suffering from afflictions. Like us, the garden exists in the dimension of time, not just in its space on the earth. And time can seemingly speed up or slow down, not always in sync with our wishes. The garden is a place of toil and a place to rest the eyes, a place of fighting weeds, and for the peace of bird song or bee-watching. It roots us in the here and now even as it reminds us that all life is constantly in flux. This entry was posted in The Long View – Meditations on Gardening and tagged Agastache, asters, bumblebee, Christa Watters, chrysanthemums, Dianthus japonica, Fireworks goldenrod, green bottle fly, Iris, Monarch, salvia, zinnia. Bookmark the permalink.